Three closely related solo card games comprise Scrolitaire. Four Play is the proper starting point for all players new to the game, and as the name may too overtly suggest, is not a bad way to massage some skills that become fairly helpful in many of the other games contained in this guide. A little experience and improved knowledge of the Scroker deck make-up will eventually earn players fairly predictable success. Hot Four Play provides the well initiated a way to "heat-up" their enjoyment. Winning Baseball, on the other hand, is nothing short of a major-league challenge—a task reserved for the serious puzzle solvers and jobless. Cards are divided into four equal facedown piles. Cards are drawn from the piles and played in front of them in an attempt to create four-letter words. Up to four words may be in work at any one time. Completed words are removed from the field of play and placed facedown in a new stack to the side. This opens a "blank" spot in the field of play to begin building another word. The game is won when the side stack contains all 13 four-letter words. Normal 52 card deck, no [Scrokers]. Deal four equal piles face down (Draw Piles). Turn top card of each pile face-up in front of each pile (Playing Field). First, turn the new top card of each Draw Pile face-up. 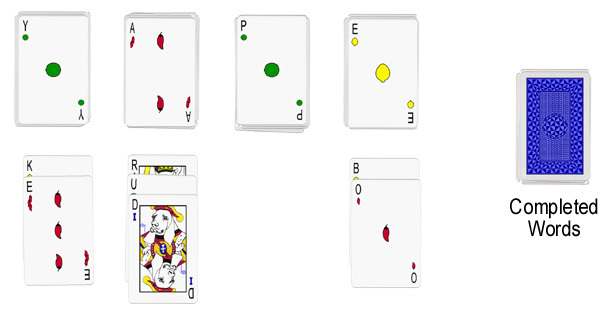 Any top card of any of the four Draw Piles may be played (may begin or add to an array) on any of the four spots of the Playing Field. When the top card is taken from a Draw Pile, the subsequent card in that pile is turned face-up to become the next top card. Lone letters or arrays in the Playing Field may be moved (in tact) and played on a letter or array in one of the three other spots of the Playing Field. An array that reaches four letters must spell a word, at which time it may be removed from the Playing Field and placed facedown in a "Completed Words" stack to the side. This creates a vacancy in the Playing Field for another array to begin. When a vacancy occurs in one of the four Draw Pile spots, only the top card from another Draw Pile may be relocated to that vacancy. Win by finishing with all 52 cards in the "Completed Words" stack. Be aware of letters most likely to turn up such as "A’s" and "E’s." Plan for the most restrictive letters such as the [Q] and [Z]. Hot Four Play is a simple variation of basic Four Play requiring the inclusion of one Chili Pepper in each word created. The Objective, Setup, Rules and Scoring are identical to that of Four Play with only one exception. Chili Peppers are hot. In this case, exactly one letter in each completed word must be from the Chili Pepper suit. Following a win of Four Play, successfully reorder into 13 four-letter words a deck that has already been arranged into a stack of 13 four-letter words. Base: A location at each of the corners of an imaginary miniature baseball diamond that surrounds the playing field. First, Second and Third Bases are the right, top and left corners respectively. Walk: To place a card face-up just below First Base by itself or add it to other cards already walked. Slide: Cards may be "slid" by keeping them facedown and moving them to the back of the deck. Normally, a player counts off the desired number of cards to be slid with the thumb and moves them as a group, without disturbing their arrangement. Successful completion of Four Play will leave a "Completed Word" stack that is ordered precisely from top to bottom as 13 four-letter words. The top four cards on the deck are used to begin the new Playing Field. The remaining twelve words are divided into three equal stacks of four words each, remaining facedown and placed respectively at First, Second and Third Bases. The player then picks up the first mini-stack of four words from First Base. Holding this stack still facedown in hand, he may 1) "play" a card, 2) "walk" a card or 3) "slide" a card or cards. When four four-letter words have been created, the playing field is cleared, those cards re-stacked on First Base. The player is said to have "reached First Base." Second and Third Bases are reached similarly. Home plate is reached when the remaining four cards (after Third Base has been reached) also spell a word. This game is an advanced level of Scrolitaire, intended for the committed puzzle solvers. Standard 52 Card deck, ordered from top to bottom as 13 four-letter words. The top four cards are dealt face-up into each of the four vacant spots of the "Playing Field" (as defined in Four Play). The player lifts (intact) the next 16 cards from the top of the deck and places them facedown on First Base. (These should be the 9th, 10th, 11th and 12th words added to the stack during Four Play). The next 16 cards (the 5th – 8th words from Four Play) are similarly placed on Second Base. The remaining 16 cards (the first four words added during Four Play) are likewise placed on Third Base. The stack of 16 cards sitting on First Base are then picked up and held in the hand facedown to begin play. Advanced players will develop strategies for winning Baseball that begin as early as the beginning of Four Play. Since there is no requirement in Four Play to immediately remove completed words from the playing field, a bit of flexibility in the final order of stacked words may be achieved. Probably the greatest advantage may be gained by allowing the last four words to remain displayed in the playing field before choosing which one goes to the pile last. A Four Play player that is planning to play Baseball afterwards may also opt to create the mini-stacks of completed words directly on their appropriate bases. A player conducting this "on-the-fly" type setup may send his completed words to whatever base he cares to, provided that he does not move any cards from base to base and when the 12th word is added, all three bases have exactly four words on them. The last word picked up during Four Play always becomes the first four letters in the Baseball Playing Field. Once the top card in the hand has been turned over, it must be either "played" in the playing field or "walked." The walked card array may not exceed four letters. Cards played are vertically arrayed in the Playing Field. No letters may be moved from one array to another. When the field of play has been successfully filled with four four-letter words, all four words are picked up from left to right and placed face down in a "Completed Words" stack on First Base. The four remaining cards, either in the hand or walked, become the new first letters of the yet to be created words in the Playing Field for a second round of play. The second round of play proceeds as the first with the exception that the cards to be played come from Second Base, and the completed words at the end of the round go back to second Base. The third round proceeds similarly, but ends differently. Once the last word is completed on the Playing Field, no more cards may be walked. The words are gathered and placed on Third Base. Any cards that have been walked during that round are picked up as an array and placed facedown on top of any cards that are in the hand. The fourth round begins. During the fourth round, the player attempts to create a single four-letter word. Cards may be only played or slid until all four cards have been vertically arrayed in the Playing Field. Reached First Base: The player successfully completing one round of play and put four completed words back on First Base. Reached Second Base: The player successfully completing two rounds of play and put four completed words back on Second Base. Reached Third Base: The player successfully completing three rounds of play and put four completed words back on Third Base. Reached Home: The player successfully completed four rounds of play, and finished by successfully wording with the four last cards in his hand. Hit a Homerun: The player successfully completed four rounds of play, and finished with four walked cards that already spelled a word. He merely moved the last completed word into the Playing Field. Hit a Grand-slam: The player "Reached Home" without having walked a single card throughout any of the rounds. Successful navigation of this game begins during the ordering and noting of the words as they are completed during Four Play. Grouping words with some sort of relationship to each other can aid in the recall of them. A novice should not worry about controlling the content of the "walked" cards and treat "Reaching First Base" like a win for a while before attempting extra bases. Sliding cards in groups of four can be helpful for skipping words or getting to the first letter of a forgotten word to refresh the memory and determine the usefulness of the underlying couple of letters. Considering the number of vowels available during a given round may help determine the best starting word. In general, words with three consonants provide better starting letters than words with only two or one in them.